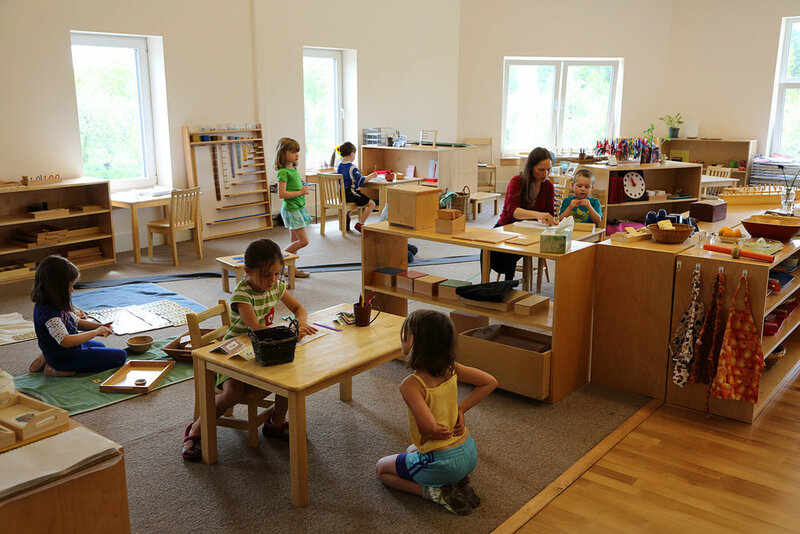 One of the most important elements of any Montessori classroom is the prepared environment. Montessori educators put great effort and intention into making sure the classroom environment is organized in such a way that it invites children to learn and aids in their personal independence. In a Montessori classroom you will not see a teacher’s desk as a focal point. In fact, you will not see a teacher’s desk at all. The environment is a tool to be utilized by the children, and it is prepared in a way that serves them best. Montessori educators make decisions based on what they have learned in their training and what they know about child development. Children’s needs are not only different from the needs of adults’, but they are different depending on what developmental phase (or plane of development as Montessori called it) they are in. One of the most basic elements to consider is the selection of appropriate furniture. Tables and chairs are sized for the children who will be using them, and they are made of natural materials whenever possible. Shelves that hold materials are low enough that children are able to easily access their work. The materials on the shelves cater to the specific age group that the classroom intends to serve. While one will certainly notice some commonalities across the levels, materials in a primary classroom are quite different from those in a lower elementary classroom. This is an intentional approach aimed to meet children where they are developmentally. Children are not meant to sit in a chair for long periods of time. Their growing bodies work best when they are able to move around. Montessori classrooms are designed to empower children and give them opportunities for movement on an individual and independent basis. If you visit a Montessori classroom, you are likely to find rug space where children can sprawl out, special floor chairs or cushions, group tables, and individual seating. Children do not have assigned seats, but rather self-select. They also tend to move around quite a bit between using materials in order to experience variation. This teaches them to listen to their bodies and recognize when they need to stretch, when they need to rest, when they might work best with a friend, and when they require a bit of time alone. Montessori classrooms have structures or materials that allow for children to develop gross and fine motor skills within the classroom. In fact, addressing those developing skills is a main goal of toddler and primary classrooms. Many have easy access to the outdoors as well. The materials one will notice on the shelves of a Montessori classroom are typically arranged into particular areas. Again, this will look different for different levels, but the basic idea is the same. This is the area in which your child will practice preparing snacks, cleaning up spills, and caring for plants and pets. These materials allow children to practice developing and discerning their senses. There are materials that help children recognize differences in size, shape, smell, sound, and so much more. This one is self-explanatory, although the materials your preschooler uses to learn basic math skills are a far cry from what many of us experienced as children! Children at the age area learning basic letter sounds, how to form the letters, basic grammar concepts, and so much more. In a Montessori classroom, the cultural studies refer to history, geography, and science. Typically history work is saved for when children read lower elementary and beyond, but your preschooler and kindergartner will learn about botany, zoology, landforms, and biomes of the world. In an elementary classroom (and beyond), most of the areas remain, with the exception of the sensorial materials. Older children have work that focuses on math, language, and the cultural areas, with some age-appropriate practical life studies as well. There is an unrivaled beauty in the natural world, and as Montessori educators, we believe that nature has much to teach children. While we place value on giving kids opportunities to get outside, we also take great care to bring the natural world inside to surround them as they learn. Montessori classrooms are home to things like live plants, class pets, fossils, tree branches, or interesting rocks These items are displayed beautifully and inspire children to wonder, question, and seek out more. Children are great collectors, and most parents are familiar with pockets full of pinecones or tiny fingers wrapped around a smooth stone. Our children are often excited to share these treasures at school, and Montessori classroom encourages inspiration drawn from the natural world. Montessori classrooms are not painted in bright primary colors, nor will you find walls full of busy posters and student work. Our environments are kept simple for a reason: we believe that the learning materials are enough to spark a child’s interest. They do not need anything flashy, and a simple backdrop allows them to turn their focus to learning. You have likely noticed that the materials are arranged neatly on the shelves, but did you know that even the order and placement on the shelves is intentional? Generally speaking, the simplest materials, or the earliest lessons, are placed on the shelves first. The more difficult or complicated the works get, they are placed from right to left, from the top shelf to the bottom. Children understand that they must return a material to the exact spot from which they retrieved it. This sense of order and organization again allows the children to focus their efforts on the work. The Montessori environment is considered one of the greatest teachers of the child. If the adults prepare it sufficiently, children are able to work largely independently. When learning and independence are combined, children gain a sense of self that is very difficult to convey otherwise. Did you know that most Montessori materials are autodidactic? That is, they are designed in such a way that the child is able to learn from them without the help of an adult. If a mistake is made, the work either cannot be completed or can be checked by the child without assistance. Children understand when they have made an error and can immediately work toward figuring out a solution. The environment not only teaches the children, but the adults as well. As Montessori educators, we are keen observers. If our students are struggling in any way, the first question we ask ourselves is, “What could be altered in the environment to meet the current needs of the child?” These observations, insights, and adjustments are usually all a child needs to get back on track.